Long-time readers will no doubt already know that I have a soft spot for Detroit-based Shinola. I grew up with Detroit being the city I was “from” (disclaimer: I was a suburbanite) and that was the city I knew. The Tigers, the Pistons, the Lions, the Redwings – those were “my” teams. While I no longer call Metro Detroit my home, I still visit there to see my family. On one of those visits, I went and toured the Shinola facility. Today, we’re having a look at a watch from their Great Americans series, the 47mm Shinola Runwell Statue of Liberty Watch. 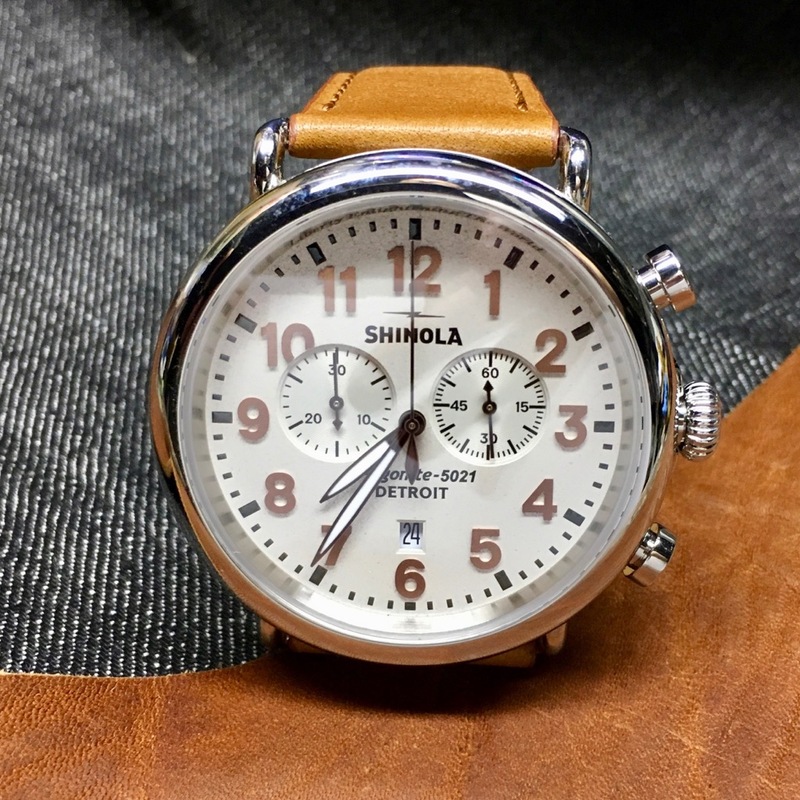 Long-time readers will also already know that I am generally not a fan of chronographs – so why would I ask the brand to have a look at the Shinola Runwell Statue of Liberty Watch (there are non-chronograph versions as well)? It’s all due to that caseback. You see, there’s the very recognizable torch there from the Statue of Liberty. As well, when the watch was announced, there was an event that featured recently-minted citizens. And that just resonated with me, as both sides of my family are fairly recent immigrants to the country, and both ended up in the Detroit area. So, call it what you will, but the story built around this particular watch clicked for me, and enmeshed with my own family’s story. Along with the story, there are numerous details on the Shinola Runwell Statue of Liberty Watch that I find myself rather a fan of. First off, that caseback is really pretty awesome. I’m all for a good engraving, and the two-tone affair we’ve got going on here is just super nice. On the front of the dial, you’ve got engraving on the rehaut that is hiding in plain sight – “Liberty Enlightening the World”. As it turns out, that’s actually the name given to the statue by it’s sculptor, Frederic-Auguste Bartholdi. So, there’s some enlightenment for you and me as well., Then over on the crown you’ve got a copper tone (just like Lady Liberty) used in place of the usual orange, and raised numerals with the tone of a penny. Even the dial texture is used to invoke the statue, with a rough, almost pebbled look that is supposed to emulate the concrete base of the statue. So, yeah, there are a lot of really great details with the Shinola Runwell Statue of Liberty Watch in my book. Outside of these additions, this is very much a Runwell chronograph, through and through. You’ve got the Argonite 5021 movement inside, which is a Ronda movement assembled in Detroit keeping all of the functions running. This is, of course, a quartz movement, so you get some tidy accuracy coming along for the watch as well, even if you’re only wearing it intermittently. That’s a big question, though, right? How is it to wear the Shinola Runwell Statue of Liberty Watch? For starters, unless someone is super-aware of what this particular limited-edition watch represents, they may not know it from any other one. And, yeah, I’m ok with that – we don’t need to be beat over the head with the patriotism. The other concern, with wearability, would be the case size. Unless you’re Arnold, a 47mm case is a big case. Here, this is a watch that wears a lot smaller than it would be thought. This is partly due to the thinner case profile (a benefit of quartz movements), but mostly due to the wire lugs. This makes for a lighter lug visually, and given how short they are (and how quickly they bend down to wrist level) they do not add a lot more to the dimensions. This means that, while I normally prefer watches under 42mm, this is a 47mm watch that I gladly (and comfortably) wore.